Two orders lead the American Concrete Pipe Association 2017 agenda: staff transition and message reinforcement. Ahead of the annual convention in March, the group announced that Russell Tripp, P.E., would succeed staff president Matt Childs, who moved to a management post at HawkeyePedershaab Concrete Technologies, one of the ACPA’s leading associate members. “Russell Tripp’s knowledge of our industry and association has allowed him to transition seamlessly into the post. The ACPA staff is the very best at what they do and we appreciate all of their efforts,” says 2017 ACPA Chairman Darren Wise, who serves as vice president of Operations, Drainage Pipe & Products Central Region, for Irving, Texas-based Forterra. The association conducts industry outreach, market development and technical activities through Education, Government Relations, Infrastructure, Quality/Safety and Research Committees, along with a network of nine state or regional engineers. “The expanded engineer program has increased our coverage across the United States. With the support of Canadian members, our influence is truly international,” notes Wise. The association reinforces members’ stakes in drainage construction through the “Quality Cast” Plant Certification Program, covering material, finished product and handling/storage procedures, plus performance testing and quality control. Available for storm sewer and culvert pipe, sanitary sewer pipe, box culverts, three-sided structures and manholes, QCast anchors a message of product quality, performance and sustainability that ACPA sends public and private construction interests. “We believe that future infrastructure investments must be in products that are durable and built to last, so it is imperative for design engineers to consider all elements of nature, including fires and floods resulting from storms that may cause premature failure,” Wise explains. ACPA has continued to combat the use of failure-prone, concrete-free drainage structures through outreach to departments of transportation. Current efforts have been focused on state engineers and their colleagues understanding provisions of the FAST Act, which funds the federal highway program from 2016-2020. Despite plastic pipe industry maneuvers, it sustains a provision—Section 1525, State Autonomy for Culvert Pipe Selection—with which predecessor MAP-21 compelled the Transportation Secretary to ensure that states can determine without federal interference the type of culvert material to be used within their borders. Materials preference legislation, under the guise of promoting “open competition,” seeks to legislate technical decisions related to pipes and other materials that should be made by licensed engineers and local communities. The marketplace for pipes and other materials is already open and competitive, which calls into question the stated purpose of this legislation. Technical decisions on pipes should not be made in the political arena, but rather by professional engineers based on the unique needs of each system, taking into account critical factors such as structural integrity, soil compactibility, maintenance and life cycle costs. Efforts to pass this legislation in the states have been uniformly rejected, as have previous efforts in Congress. On behalf of the tens of thousands of water systems, the engineers who serve them and the public, we respectfully urge you to oppose materials preference legislation. Along with keeping lawmakers apprised of “materials preference” schemes, ACPA has fostered a highly effective event for state and federal agencies and taxpayers. Thirty states representing nearly 75 percent of the U.S. population provided proclamations recognizing 2017 Concrete Pipe Week, August 22-26. The event launched in 2015, with proclamations in 11 states accounting for about one-quarter the population, growing last year to 26 states representing 64 percent. During Concrete Pipe Week, producers host plant tours and employee appreciation events, and engage federal, state and local elected officials in discussion of product quality and performance as they relate to storm and sanitary sewer infrastructure. The industry also underscores the indisputable contributions that producers, their team members and customers make to the economy and environment. After a successful 2016 launch and solid follow up year, the 2018 Pipe School and Pipe Show will move from Arlington, Texas, to Murfreesboro, Tenn.—home of Middle Tennessee State University and charter Concrete Industry Management four-year degree program, of which ACPA has been a long-time supporter. The Pipe School, January 15-18, will feature Engineering, Quality (QCast personnel accreditation), Production, Technical Marketing, and Sales tracks. The Pipe Show, January 16-17, will offer associate and producer members two days of private meetings and social functions. The 2018 Pipe School and Pipe Show is themed Every Day Matters in a nod to a) a Federal Highway Administration program, Every Day Counts, aimed at speeding up project delivery and addressing budget challenges; and, b) guest speaker Bob Chapman’s scheduled presentation, “Everybody Matters,” exploring a leadership approach rejecting the idea that employees are “simply functions, to be moved around, managed with carrots and sticks, or discarded at will.” In addition to ACPA producer personnel, participants will include consultants and municipal or state engineers attending under scholarships from ACPA and state concrete pipe associations. Since its 2015 formation from Hanson Pipe & Precast and Hanson Building Products assets, Forterra has emerged as the leader in water-related drainage and transmission products in the United States and eastern Canada. Based in Irving, Texas, Forterra operates upward of 70 plants under three concrete businesses, Drainage Pipe & Products, Structural & Specialty Products and Stormwater Management Systems, plus 26 plants under Water Pipe & Products, the leader in ductile iron transmission solutions. Established in 1907, ACPA is the voice of the industry and a nonprofit organization of concrete pipe and box culvert producers and allied equipment manufacturers, material suppliers or service providers. Member companies are located throughout the U.S., Canada and 40-plus overseas countries. The association provides a wide range of research, technical and marketing support materials to promote and advance the use of concrete pipe and precast boxes for drainage systems and many other applications. 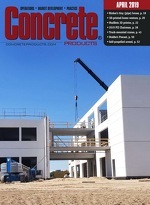 ACPA’s www.concretepipe.org site archives, coupled with social media network, funnel a wealth of information, knowledge and document download offerings. Members account for 90 percent of U.S. concrete pipe shipments. Through ACPA, they advance knowledge of sound drainage strategies and deliver education programs focused on all aspects of pipe and drainage structures. The annual Pipe School is oriented to member company staff plus drainage system engineers and other stakeholders at the federal, state and local agency level. Rigorous in content delivery, it encompasses concrete pipe and precast box courses, training and certification for graduates, member-hosted plant tours, and quality sessions. Course developers are especially mindful of the mechanical, electrical and computer competencies that managers and production employees need to maintain and operate modern concrete pipe plants. Ongoing education for ACPA members and their customers or prospects continues across the calendar through webinars on technical, marketing and sales topics. ACPA regional engineers and state association counterparts deliver additional education and training to agency personnel and drainage system specifiers. Unified training solves local issues quickly and galvanizes communications of all forms at state and local levels. Gossett Concrete Pipe Co., Inc.